Any fans of gadgets out there? I am sure most of you are gadget lovers and with the implementation of GST, our pockets and wallets have been crying to us. Here's some good news! 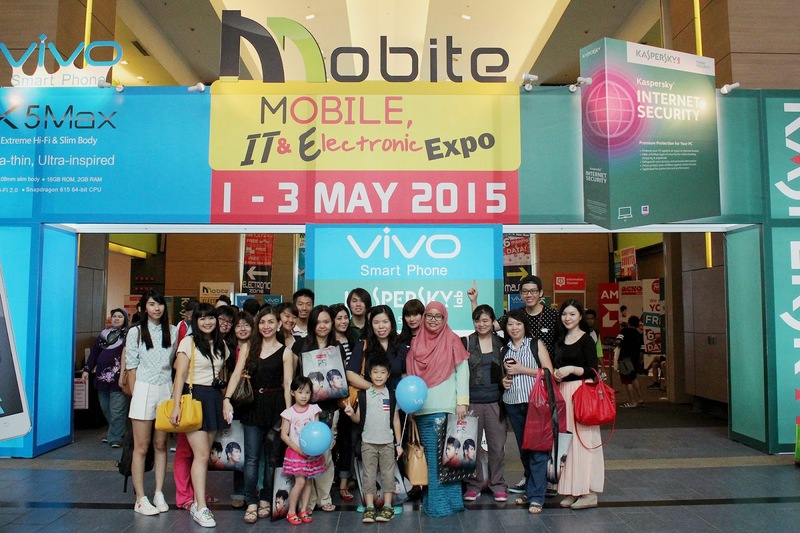 The Mobile, IT and Electronic Expo (MOBITE) is here at MidValley Megamall and it started from yesterday until tomorrow, 3 May 2015! I went today and really got some awesome buys. Here are some of the great deals and offers you must quickly head to when you are in MidValley Megamall. The most important reason to shop at MOBITE is their 'You Shop, We Absorb' GST Campaign. This means now you can shop without worrying about GST at MOBITE. Kaspersky Lab is offering Kaspersky Internet Security for Android available at RM 9.90 to help more consumers secure their mobile devices. So now no more worries about our mobile phones getting attacked! Not only that, check out Tune Talk promotion where if you buy any device at MOBITE, you will be entitled to 6 months FREE data! Especially if you travel a lot, Tune Talk is a great option to try and now with the additional 6 months of FREE data what do you have to lose? Also check out the super urban chic tea store at the Tune Talk booth with their seats made from skateboards! Going further down, grab a cup of free Slurpee at the AMD booth! You'll need it to stay cool while browsing through the exhibition. Also enjoy the AMD Cool Zone that features special Live Demos throughout the day involving several unique features from AMD. While you are at MOBITE, make sure to check out the Vivo booth as they just recently launched their latest phone the X5 Max which is ultra-thin and fast too. There are also great deals for printers and accessories that you can check out if interested. Most importantly, you HAVE to check out the COURTS booth with super bargains from RM 0.28. I am not kidding you! I got a 16GB Mico SDCard and an ACER laptop bag for only RM 0.28 each. This promotion is available at their booth from 11am - 12pm, 3pm - 4pm and 8pm - 9pm! There are also other IT and Electronic items on sale with super low prices. I spotted this super cool item called meitrack that is really useful to rack your loved ones. Now I am not encouraging you to track your other half but you can use it especially when you go hiking, jungle trekking, for the elderly or even children. You can track their whereabouts and even listen to their surroundings using this device. Plus there is an SOS button which is useful during emergency situations. KooZaa DotCom which is the official eStore partner of MOBITE is another booth you just have to stop by. They actually had Pre-Order Hot Deals prior to the event with exclusive deals up to 90% but no worries if you missed it because you can still get these hot deals on first-come-first-served basis. Come early to the Expo and get their hot deals like Tech Titan 8GB Thumbdrive at RM 1, Tech Titan 8400mAH power bank at only RM9.90, Seagate HDD 500GB at RM99! So come early to get your deal vouchers at the entrance. I would advice you to come at least 30 minutes before they open the shutters because even when I went today there were already quite a few lining up! Besides the Expo, there are daily auctions from RM 1 tech must-haves and on-stage activities such as quizzes, magic shows, product presentations and contests! Congratulations to the winners of the Kaspersky contest. If you are feeling hungry while walking around, stop at Sangkaya's stall right in the middle of the Expo! If you have not tried this, you have to stop and try it! The creamy coconut ice-cream served in the coconut shell was just heavenly. Selling at RM 10.50 for 4 scoops this is a really amazing dessert. I have heard tons of reviews about Sangkaya but have not had the chance to try it out so it was a delight to see them setting up a stall at the expo. For those of you looking for accessories, stop by the Tech Titans booth with amazing buys! They were selling wireless mouse at just RM16 and laptop sleeves at RM10. I wanted to get one for myself but unfortunately they did not have the 16" size. Aww my pink laptop sleeve :( There were also cooler pads with 6 fans selling at only RM25! The last booth to drop by is the Acson booth where they are giving RM300 discount off their air-conditioners and also giving away the 7 piece cookware if you purchase their airconds! Not only that, if you spend a minimum of RM 100 in a single receipt during the event, MOBITE is rewarding visitors with a chance to win a VIVO smartphone and walk away with a SURE-WIN gift! Plus thanks to Acson, fans of pop idol duo FuYing and Sam will make their appearance to meet their fans at MOBITE! Tomorrow is the last day for MOBITE so make sure you stop by and check it out. For more details, visit http://www.MalaysiaITFair,com.my and to make sure you don't miss out on the next IT Fair, like their Facebook page at http://www.facebook.com/MalaysiaITFair! ok this is not related to the IT Fair, but Sangkaya increase 50cent already? -_- last time i bought during Charles & Keith warehouse sale was RM10.